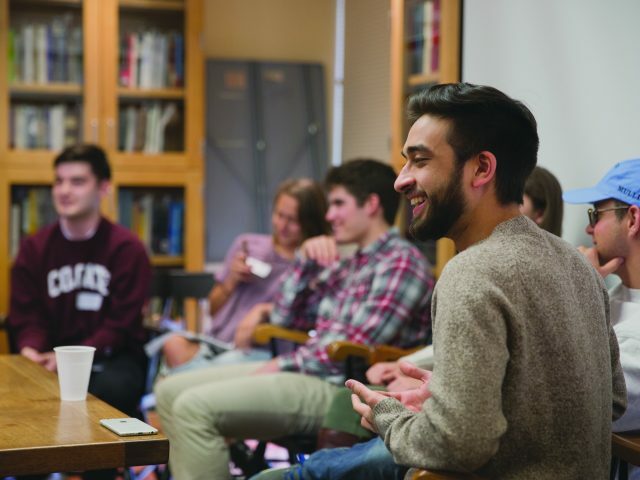 Ural Mishra ’20 was elected Bowdoin Student Government (BSG) president Sunday night after prevailing in a three-way race in BSG’s first elections governed by ranked-choice voting. Just 926 students voted in this year’s elections, down from 1,075 last year and 1,234 in 2017. 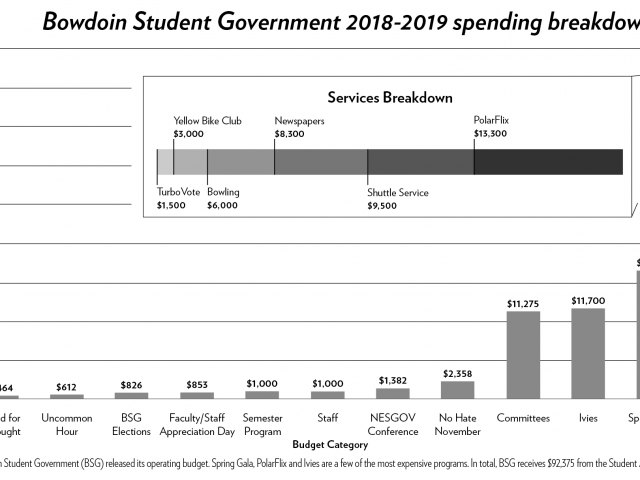 In an attempt to increase transparency, Bowdoin Student Government (BSG) has released its operating budget for the first time. Spring Gala, PolarFlix and Ivies come in as the biggest-ticket items, and students can now examine every line of the budget for themselves. On Wednesday at Bowdoin Student Government’s (BSG) weekly meeting, the majority of students voted to adopt ranked choice voting in future elections. The proposal was brought forward by Vice President of Student Government Affairs Amber Rock ’19. At Wednesday’s Bowdoin Student Government (BSG) meeting, Amber Rock ’19 was elected Vice President for Sustainability and Facilities by the assembly, replacing Ana Timoney-Gomez ’18, who resigned from her position last week saying she had too many other commitments. At its first meeting of the semester on Wednesday, Bowdoin Student Government (BSG) discussed revising its constitution and improving student counseling resources. BSG hopes to pass a new constitution before spring break, which would require one third of the student body to vote on the constitution and two thirds of those votes to be in favor. Last week, the Career Planning Center (CPC) and Bowdoin Student Government (BSG) announced a new initiative called “Just the Facts,” an attempt by both groups to better inform students of the career resources and opportunities available to them on campus, while also demystifying and debunking common misconceptions about the role of the CPC and its priorities. For the first time in over a decade, major changes have been made to the structure of Bowdoin Student Government (BSG). Nineteen liaison positions were created to work with various administrative departments and offices including Safety and Security, Dining Service and Religious and Spiritual Life in addition. 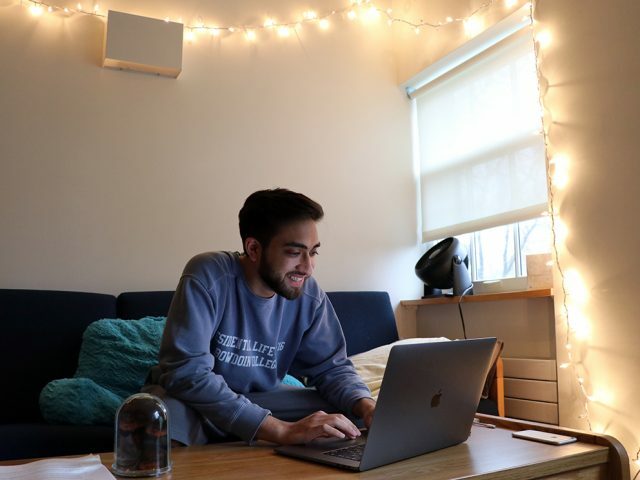 In an email to the Orient Sunday night, Vice President for Bowdoin Student Government Affairs, Ben Painter ’19 announced the results of the class council elections for the first year class. Three hundred and eighteen first years participated in the vote—approximately 63 percent of the class. In its last meeting of the year, Bowdoin Student Government (BSG) failed a bill that would have banned publicly releasing vote tallies from first-year elections, but passed several other bills that had been proposed earlier in the semester. 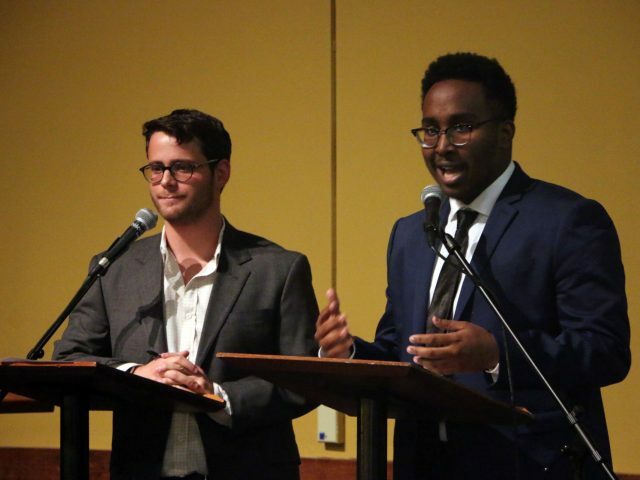 After being announced as winners in the Bowdoin Student Government (BSG) elections on Sunday, BSG President-elect Irfan Alam ’18 and Vice President-elect (VP) for BSG Affairs Ben Painter ’19 are looking forward to enacting their vision for a better Bowdoin. In an email to the Orient Sunday night, Vice President for Bowdoin Student Government (BSG) Affairs, Reed Fernandez ’17 announced the results of the BSG Executive Committee elections. A total of 1,234 students voted, about 69 percent of the student body. Irfan Alam – President Candidate Hi! My name is Irfan Alam and I am running for BSG President alongside Ben Painter as my VP. I currently serve as the Chair of the Treasury on the executive committee, and have previously served as an At-Large Representative to the SAFC and a member of the SOOC. At its Wednesday meeting, Bowdoin Student Government (BSG) discussed a revision to its bylaws that would allow any student to introduce legislation for discussion by BSG. The change would make BSG more accessible to students, according to BSG President Harriet Fisher ’17. On Wednesday evening, Bowdoin Student Government (BSG) voted on two proposals and discussed three others. At-Large Representative Jacob Russell ’17 introduced two proposals. Proposal 141544 suggested amendments to BSG bylaws. The proposal gave greater flexibility to the structure of general assembly meetings, which had often ignored BSG bylaws. After tampons and pads were thrown away and feces was found in a menstrual product receptacle in the men’s bathroom on the first floor of David Saul Smith Union last week, Bowdoin Student Government (BSG) altered the placards placed next to the dispensers to clarify their purpose.